Whilst researching for my article washing machines and associated problems with sizes I decided to check the specifications of various washing machines. I chose a healthy mix of common brands and models, and a few more obscure ones. The table shows the different washing machine measurements that I found. It is in no away definitive. And there is no information on which models they were. That data would soon go out of date. But it gives a very good idea of where slight variations in sizes can be found, and where sizes seem to be pretty standard. Use this table to decide how likely you are to find one at the smaller size you require. The results can be reordered by clicking a column. I’ve commented on a few unusual results. 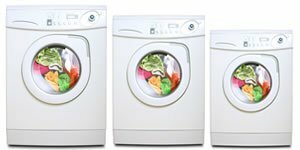 If looking for a smaller than normal washing machine read my main article (link above). You can use price comparison sites to filter washing machines on depth, width or height to try and find one. Do you correlate size to manufacturer/model, is it possible? Hello John. No I didn’t take note of the exact models and sizes as that would make my data out of date quite quickly. Manufacturers are constantly changing and deleting models. The chart gives a very good idea of the kind of differences there are though, so it’s just a case of popping onto one of the price comparison sites and filtering results on width, depth or height.